We were a little sad when we had to say goodbye to our bright red Mondraker Foxy RR test bike a few weeks ago, but we can barely remember what that 27.5in bike looked like now that this beauty has arrived. This is the all-new Mondraker Foxy R 29, and as the name suggests, this model runs on 29in wheels attached to an all-new Foxy 29 chassis. Oh gosh, this bike looks so good in the flesh! 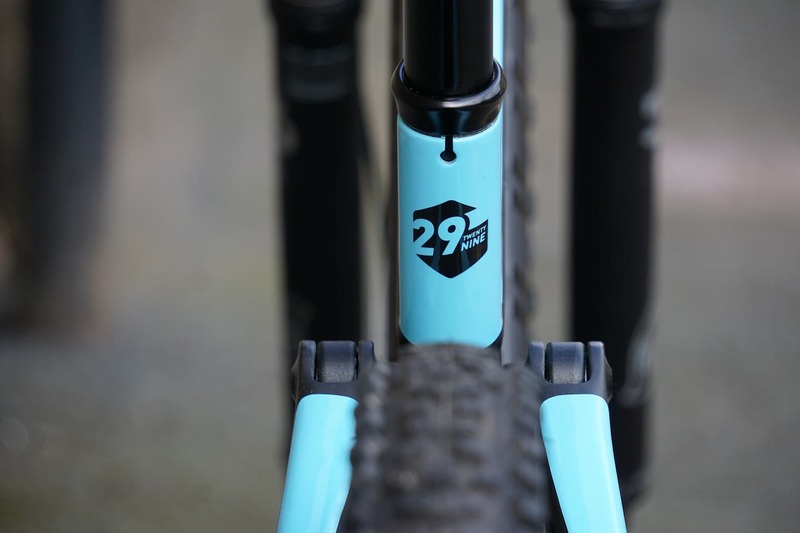 In addition to being designed for use with larger 29in wheels, the new Foxy 29 chassis is designed around a shorter 44mm offset fork, similar to what we’ve seen from Transition and Whyte. 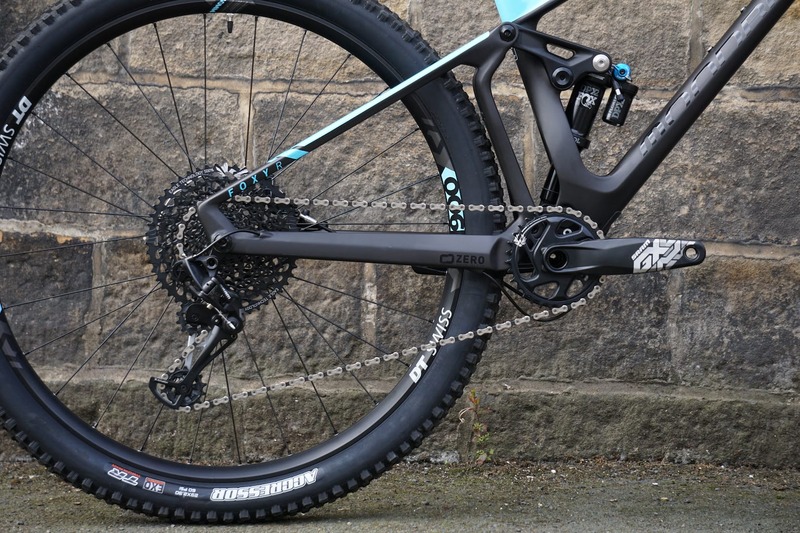 We also see that there is a little more clearance around the chainring on the 29er bike compared to that on the 27.5, which will be a welcome move for those of us who like to get rad in sloppy conditions. For those who don’t believe it has 29in wheels! 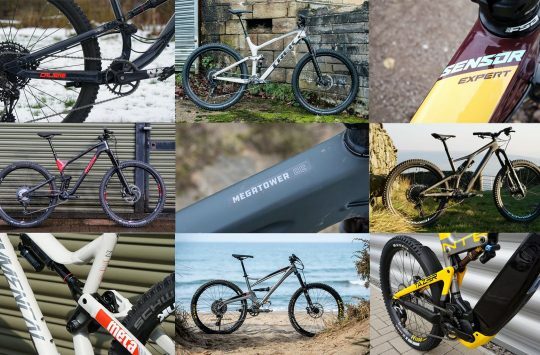 What remains the same between the Foxy 29 and the smaller wheeled bike we reviewed last month is Mondraker’s radical Forward Geometry which means that this medium-sized bike has a massive 470mm reach combined with a short 30mm stem and slack 66 head-angle. Clean carbon lines and quality bearings throughout. Mondraker has used the same Stealth frame construction technology on the Foxy 29 too, which they claim ensures a strong, stiff and lightweight frame, features which we found to be true on the Foxy 27.5. Internal cable routing is found throughout, and the bike gets Enduro MAX sealed bearings, custom frame protectors and a shock mudguard all as standard. Burly Fox 36 make more sense on the Foxy, the shorter offset will be very interesting on the trail. 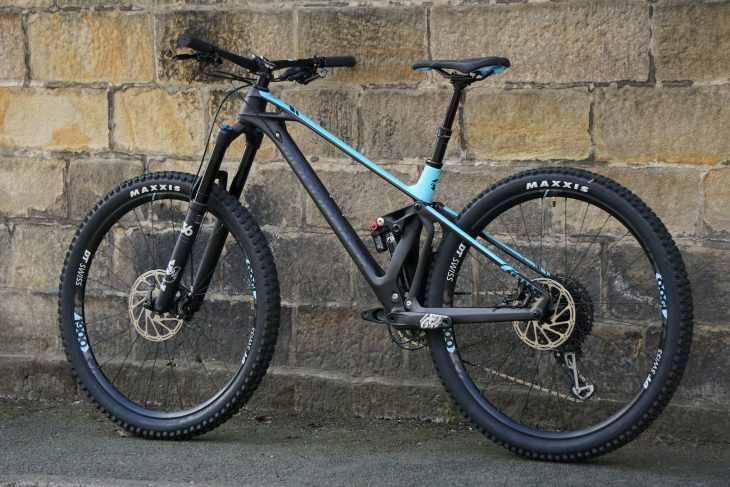 This Foxy Carbon R 29 has the same £4,499 retail price as the 27.5in RR, but there are some big specification changes on the larger wheeled model. 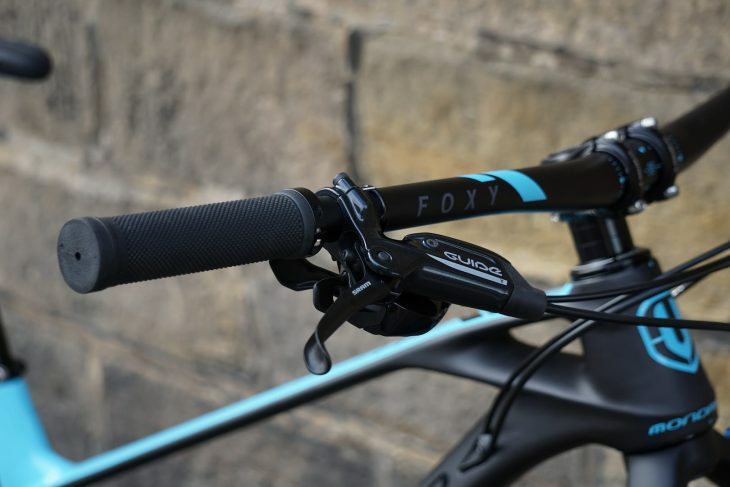 First of all the Foxy 29 R has a Fox 36 upfront, a move which makes a hell of a lot of sense considering the type of riding the aggressive Foxy instils. 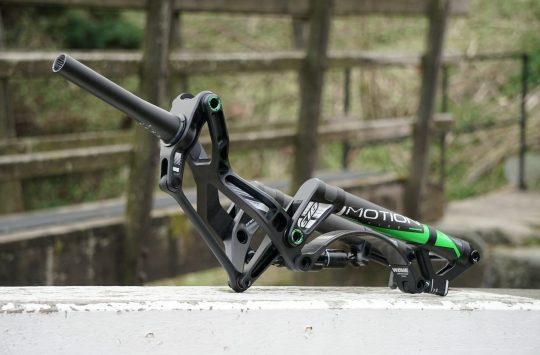 The same rear shock as the 27.5in Foxy but with 10mm more travel. Interestingly, Mondraker has actually increased the travel of the 29er Foxy rather than reduce it as we’ve seen on other bikes. 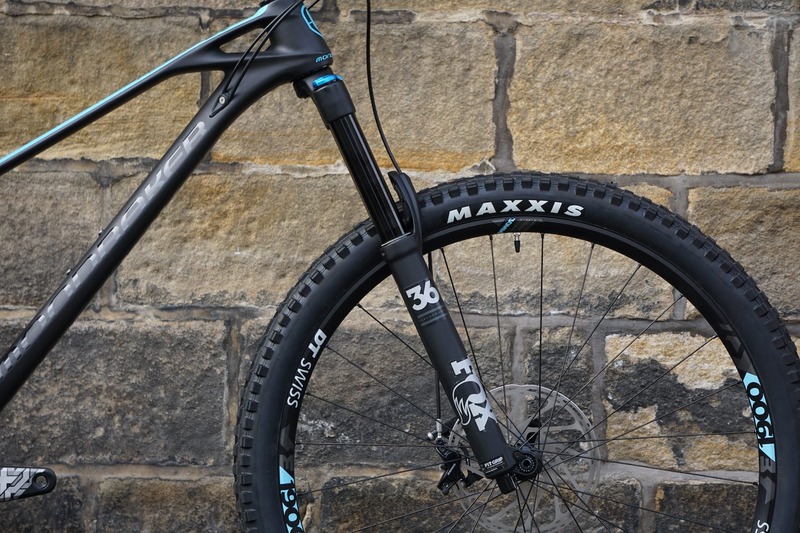 This means that the Foxy 29 has 160mm of travel up front and 150mm on the rear. This could mean even more rock smashing speed is on tap. 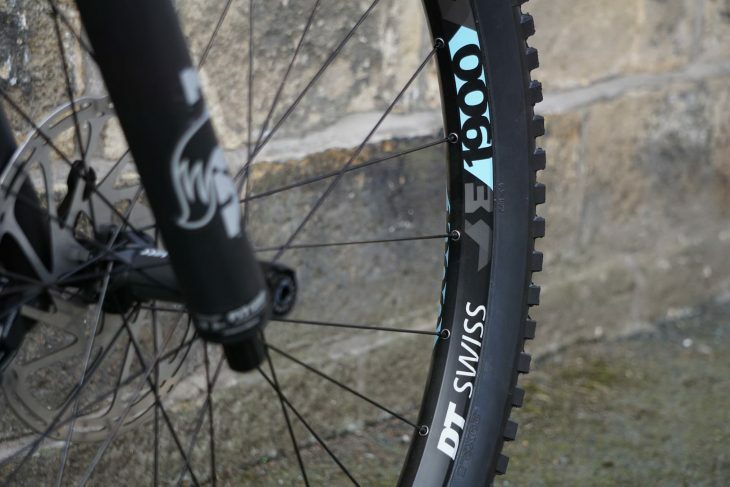 Wider DT SWISS rims are a great upgrade. Another nice upgrade is in the wheelset, which is DT SWISS E1900 duo with 30mm internal rims and DT SWISS’ 370 hubs front and rear. SRAM Guide T 4 pot brakes and larger rotors on the 29er Foxy. 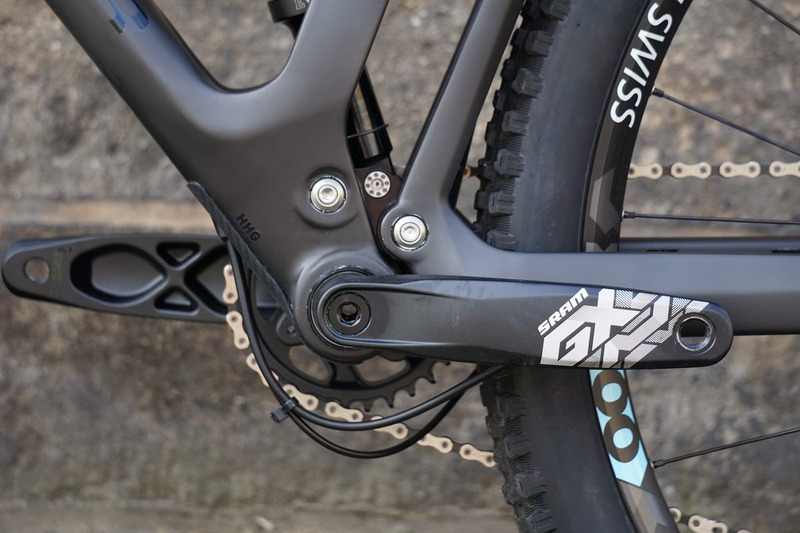 Mondraker has moved away from XT brakes on the Foxy R 29, and instead, we find a pair of SRAM Guide T 4 Pot brakes. 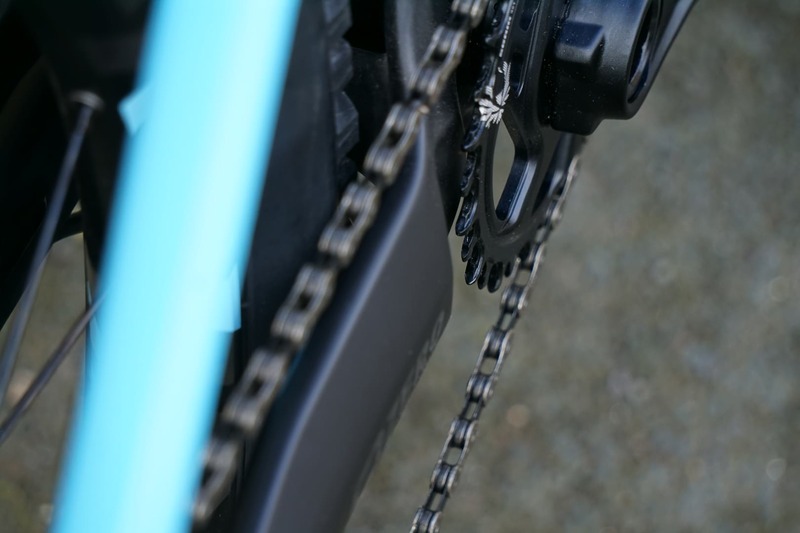 The SRAM theme continues with an SRAM GX/NX Eagle 12 speed drivetrain, including cranks and threaded DUB bottom bracket. The 125mm drop Onoff Pijia post still seems a little short to us. 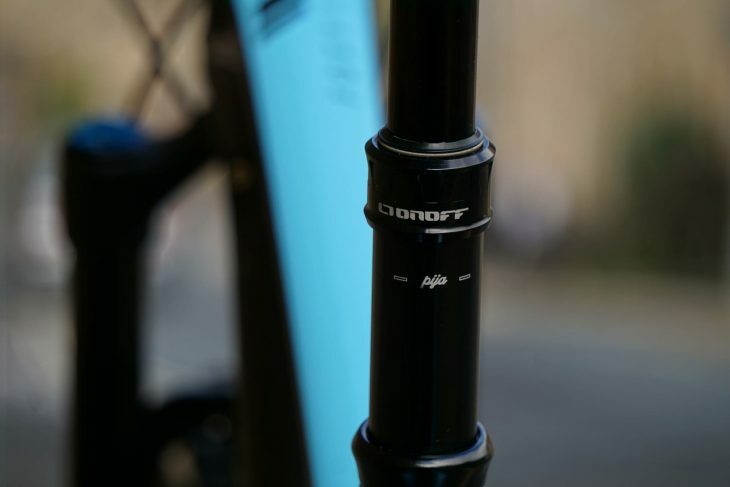 Other notable items include Mondraker’s own brand, and excellent, 780mm handlebars, a 30mm Onoff stem, Onoff Diamond lock-on grips and an Onoff Pijia dropper post with 125mm of drop. 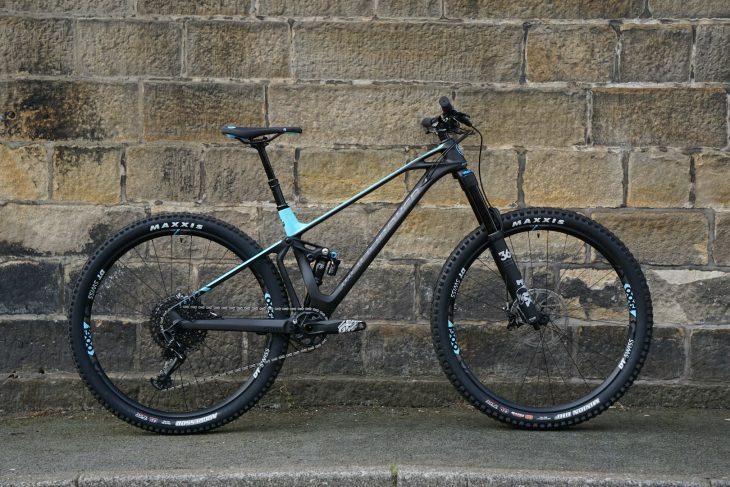 As Andi was the lucky STW team member to review the previous Mondraker Foxy RR he will be trusted to test the 29er version and hopes to have the review up in the near future. In the meantime feel free to hit up the comments section below if you have any questions about this carbon beauty. Rims // DT Swiss E1900 Spline 29, 30mm internal width, 28 spokes. Nice looking bike though. At first glance it looks like a hardtail with the inline seat stays – until you notice the shock sitting in there. This is the second 29er to really make me want one. The Sick beast with the inverted fork is the other. This is better looking. A stunning bike. That’s a very good looking bike. Nice to see a bike without the beer belly around the bottom bracket. 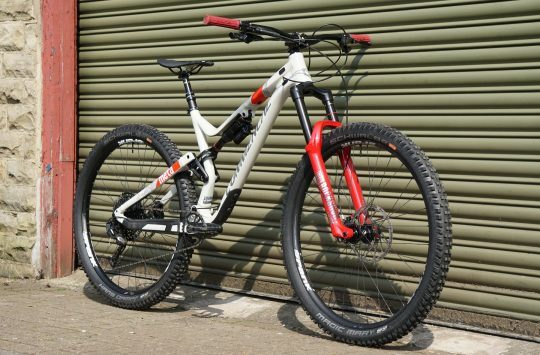 stunning looking bike, first time ive ever said that about a mondraker!! no hideous kink in the top tube!! spec was all sounding bob on aswell till they got to the dropper! what is the thinking with 125mm?? id be sticking with the XT’s too. was thinking the same about the 125, then realised the forked seat tube meaning the 125 is probably almost fully inserted already! if only the shock went up to the down tube or similar then an appropriate dropper could be installed. agreed that the lack of beer belly and the straight head tube to rear axle makes for a gorgeous looking bike otherwise!! Any alu frame versions in the offing for us cheap(er)skates?